Fridges, freezers, fridge freezers, and American-style fridge freezers are our speciality, in fact we've been offering fridge freezer repairs in London and nationwide for over 40 years. Our Refrigeration Engineers are on the road ready to attend to your appliance, so we can come out to you quick (same day and next day appointments available!). We understand no one likes to receive a long bill at the end of a repair so we keep it simple. We have a one-off labour charge which will cover you for the entire repair (as long as it takes us). All you pay for on top are for any parts you need. We are so confident in our repair service that we provide you with a six months guarantee at the end of it. 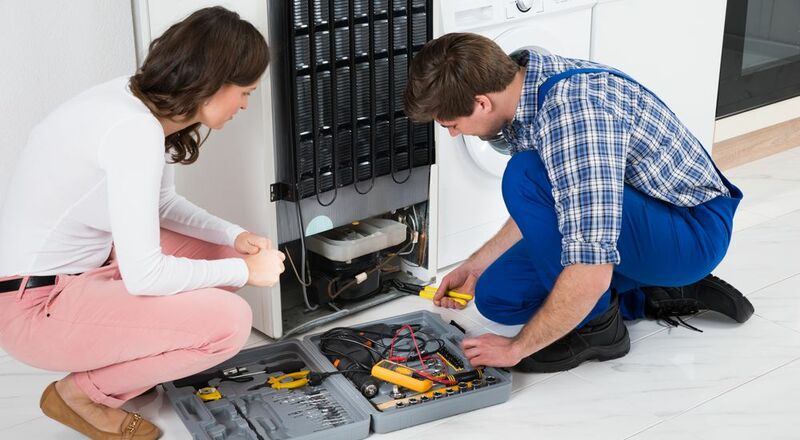 Our experience and knowledge with domestic appliances means we come across a wide range of fridge freezer faults and problems on a daily basis. If your fridge freezer has a fault chances are we've come across it before! Fridge freezers tend to struggle, and therefore break down, most when the room temperature it's in gets up to and around 30 degrees. This is especially the case with most models sold in the UK. One of the key reasons why this happens is because the condenser (at the back of the machine and therefore generally with less ventilation) cannot give off heat quick enough. As a rule of thumb the air temperature around the condenser needs to be around 10 degrees lower than the temperature of the part itself so that the energy can be given off has heat. If it cannot dispense the heat then this won't be taken away from the food which will therefore not get cold. Fridge Freezers In Garages, Sheds, Basements, Etc. On the flip side if the temperature is too cold then this can also cause a problem. Many people have fridge freezers in outer buildings or in places with lower temperatures. When it's too cold the sensor(s) can turn off as the environment is cold enough and this can lead to food defrosting. Freezers don't suffer this problem as much as they are designed to keep the inside at much lower temperatures. In areas where the temperatures are low there is a higher risk of condensation and black mould. This happens when the cool air is attracted to the warm parts of the outer wall of the appliance. Generally it's nothing to worry about however sometimes you may find this forming on the door seals leading to possible deterioration of the cabinet and rust. We make the process of repairing your faulty fridge freezer really easy! Your repair has already started back in our offices with our repair engineers triaging your fridge freezer fault(s) to see if there are any spare parts we can take with us in case they are needed. Our friendly repair service engineer will attend to your faulty fridge freezer to repair it. If any spare parts are required then they will advise you of this (occasionally we may need to order the part(s) and return to install them). Your fridge freezer has been repaired and is back up and running. As standard, you've also qualified for our six months guarantee for the same fault and any parts fitted..